Northwestern College | Graduate School & Adult Learning | Early childhood M.Ed. Earn your M.Ed. in Early Childhood online. You're building bright futures for the youngest students. You have classroom experience with water tables, DIBELS, math manipulatives and hamsters. Now you're ready for more. With Northwestern College's online Masters in Early Childhood Education (preK-3rd grade), build on what you already know to become an even better teacher. 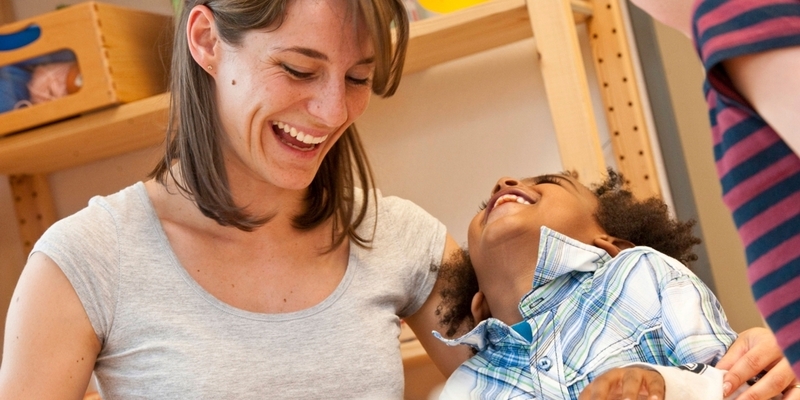 Prepare for career opportunities as an early childhood administrator, specialist or consultant. It's more than a lane change. And it's all online. Earning a graduate degree doesn't have to cost you time away from your other responsibilities. Northwestern College's online Masters in Early Childhood Education allows you to log into classes and complete your coursework whenever it's most convenient for you. Take one online 8-week class at a time, completing two classes each semester, and you'll finish your M.Ed. in 2 years or less and be eligible for financial aid. This master's program is approved for the TEACH Grant which can help you pay for your masters if you teach or plan to become a teacher in a high-need field in a low-income area. For more information visit the TEACH Grant website. (3 credits) Teachers and schools must continually examine current practices in PreK-12 education in search of better solutions to increase student achievement and to thoroughly prepare children for the world in which they will live and work. In this course students will study current social, political and academic trends and issues affecting children, teachers and schools. Students will define their personal positions based on facts and experience, and will collaborate with others to advocate for solutions that improve education for PreK-12 grade students. Prerequisite: completed bachelor's degree in education. (3 credits) Technology integration in the K-12 setting can enhance learning, improve motivation and engagement, increase accessibility, individualize instruction, differentiate assessment and improve communication with parents and stakeholders. In this course students will broaden their understanding of the technology available to them in the PreK-12 classroom and improve their ability to leverage specific technology to improve teaching and learning. Prerequisite: completed bachelor's degree in education. (3 credits) This course will provide an overview of research methodology employed for studies in the field of education. Topics include basic research methodology, interpretation of findings, and application of research in educational settings. Students will develop their ability to critically evaluate educational research and to judiciously apply findings in their professional settings. By the conclusion of the course students will be able to identify a potential topic for future research and outline the basic methodology needed to conduct the study. Prerequisite: completed bachelor's degree in education. (3 credits) In this course students will apply the cumulative knowledge and skills learned in their master's program through an action research project. Research focus may be related to student learning, teacher effectiveness, school quality, school policy or other area by approval. The project will be proposed, approved, designed, and implemented prior to the student's graduation with a master's degree in education from Northwestern College. Students who do not have a finished capstone approved by the M.Ed. Director at the conclusion of EDU635 will repeat the course for credit. Prerequisite: completed bachelor's degree in education. Note: Graded on a pass/no pass basis. (3 credits) Students will learn to design curriculum, instruction and assessment specific to the needs of diverse children ages 0 through 8. Create safe and nurturing classroom environments that are developmentally appropriate and respect diversity. Collaborate with stakeholders to meet the needs of young children. Prerequisite: completed bachelor's degree in education. (3 credits) This course is intended for experienced teachers, and will focus on building off of prior knowledge and experience to improve student learning. Research-based instructional strategies will be studied, with particular emphasis on adapting and employing strategies to fit students' cognitive abilities, motivation, interest, cultural background and other unique characteristics in diverse settings. Students in this class will apply new instructional strategies in their practice to positively impact learning in the PreK-12 classroom. Prerequisite: completed bachelor's degree in education. (3 credits) Examine characteristics of the diverse cultures and structures prevalent in American families, and how those factors influence children's growth and development. This course emphasizes strategies to improve collaboration with families, schools and community partners to improve students' success outcomes. Prerequisite: completed bachelor's degree in education. (3 credits) Intensive study of typical and atypical development of children from birth through age eight. This course will immerse you in research that will improve your ability to facilitate the cognitive, emotional, physical and social development of young children with diverse abilities and needs. Prerequisite: completed bachelor's degree in education. (3 credits) Thorough examination of roles, responsibilities and characteristics of effective leaders of early childhood programs with a focus on personal growth in leadership and communication. Emphasis on identifying areas of strength and need in programs and staffing to create opportunities for improvement. Prerequisite: completed bachelor's degree in education. (3 credits) Examine widely accepted theories of language, reading and writing development in young children. Use research and assessment data to identify curricula and instructional strategies most suited to the diverse needs of young children. Examine research and develop strategies to leverage play in providing successful literacy instructional experiences. Prerequisite: completed bachelor's degree in education. 3 credits) Integrate science and math instruction throughout the early grades curriculum, with a focus on activating children's innate curiosity, modeling habits of the mind, and fostering students' belief in their ability to learn. Focus on curriculum, instruction and assessment that are developmentally appropriate for young children. Prerequisite: completed bachelor's degree in education. Add an extra semester of student teaching to earn your Birth Through Grade Three Inclusive Setting Endorsement (Formally Endorsement 100: Early Childhood Integrated Setting) while earning your M.Ed. Here's how.